Psalm 143:10-12 says, “Teach me to do your will, for you are my God; may your good Spirit lead me on level ground. For your name’s sake, O Lord, preserve my life; in your righteousness, bring me out of trouble. In your unfailing love, silence my enemies; destroy all my foes, for I am your servant.” Doing God’s will does not come naturally; our natural tendency is to satisfy our fleshly and worldly desires. We must be taught and transformed by God to do His will. When His Spirit leads us, it is on level ground. He alone can make crooked paths straight. Our duty is to remember that what we do is for His name’s sake. It is not about us. He alone can best determine how He desires for us to bring glory to His name. It is not for us to determine. Despite hardships, trials or persecution that may be allowed in our lives, God can preserve us and bring us out of our trouble. Our only responsibility in all of this is to simply remember our role. We are to be servants of Christ. Often we grow weary because we are trying to do His part. We are trying to figure out where He is taking us rather than allowing Him to lead us. We are trying to figure out how to preserve our lives and bring ourselves out of trouble rather than allowing Him to bring us out. We are trying to silence our enemies and destroy our foes when that is not our work. We are not made for those things, and it is exhausting. Our duty is simply to look to God and serve Him, allowing Him to do these things for His servants! We don’t have to strive, we simply have to come to Him. His yoke is easy and His burden is light; we will find rest for our souls. May we faithfully seek Him, serve Him and remain completely in Him, trusting Him to show us each step! Thank you Patrick. Last night I started using yet another binding agent (Zeolite) to try to encapsulate and detox mercury from my weakened frame. Afterwards I felt very weird! We were Skyping with my husband’s daughter in Thailand and it was all I could do to chat a bit, smile a bit, and keep my shoulders from hiking up to my ears! The nightly seizure attack episode was significantly shorter and I fell asleep at a more reasonable time, around 1:30 a.m. Hell was waiting for me this morning and returned with more violence a couple of hours later. Can you say “mad as a hatter?” Well if you were a hatmaker in the 19th century you might be more familiar with mercury poisoning than the current medical profession. So let’s see if we can figure this one out, eh? #2 Follow the clues and think about how chelation works for mercury and heavy metals. Most protocols require regular treatments for a given interval of time, sometimes as often as every 4 hours. (See the Cutler protocol.) The rebound occurred about 12 hours after the first dose of a true chelating agent. #3 Consider a repeat, low level dose at regular intervals to bind and remove the newly circulating toxins. #4 Relief came within minutes when the detox agent was consumed with lots of water. #1 Unfailing love in the eyes of my intended beloved, Steve. When I am in his arms no matter what the circumstances, I feel the love, care, and compassion of my Heavenly Husband too. Thank you Jesus for Steve. Please love and bless Him. Cover our marriage with your grace. May others see a good work in all of this for your glory Lord. #2 Treatment options that provide some relief. I believe that the pattern of suffering is about to change for the better and we are exceedingly grateful. #3 Wisdom that ultimately comes from the Lord. I have learned so much these past 3 years and have received blessings, gained new skills, met new people, cleared out some excess baggage, and found a voice that I pray will glorify you here. #4 Hope. No matter what the burden may be (and we both need not look far to see horrific burdens that our brothers and sisters in Christ must bear for their belief in Him), He will prevail. 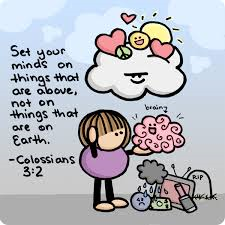 As a new friend, Karan Gleddie, brought to light this week we are to “set (our) minds on things above, not on earthly things.” (Col. 3:2) Therein we too will find our hope, our peace, our happiness. And as Patrick reminded me, we are to serve with the strength of Christ for His namesake. With our eyes on Christ all things are possible. Gentle Reader, how may I pray for you today?